Learn with narrated and illustrated course content. Test your knowledge with quizzes after each chapter. Pay $9.00 only when you pass the final exam. 20 multiple-choice visual exam questions. After successful completion of the final exam, you will be able to print your Temporary Waterskiing Endorsement. 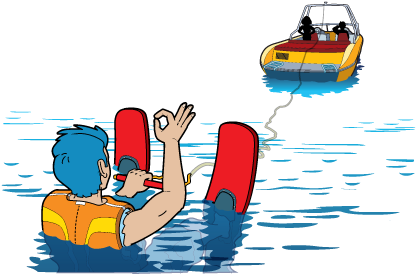 Once you receive confirmation from the Boating Division that it is available, retrieve your Safe Waterskiing Endorsement from the Online Sportsmen Licensing System. When you register for the course, you will be required to provide your Conservation Identification Number. If you have a Connecticut Hunting or Fishing License, your Conservation ID will be the same ID number that was assigned with the hunting or fishing license. You MUST use the "Search by Personal Information". Enter either your driver's license number or social security number to see if you are in the system as having a Conservation ID number previously issued to you. If you are not found in the system, select the option at the bottom of the screen that reads "Select Here To Receive Your Conservation ID Only For An Education Course Registration", and complete the registration process. Follow the instructions for "New Customers".